Bees are the world's most important pollinating insects and are worth about £200m a year to British agriculture. Their dramatic decline in numbers has become a cause of global concern. Across the UK people are joining Bee Part Of It, a BBC project supported by wildlife presenter Kate Humble, to create local bee-friendly spaces. "Most of our wild honeybees have died out and we, as humans, are very dependent on bees to pollinate food crops," said Kate. "I realised that by becoming a beekeeper I could do something really tangible to help the fairly desperate situation that our bee population has found itself in. "If you believe what Einstein is reputed to have said - we would only survive for four years if there were no bees in the world," she added. The National Trust is one of the country's biggest landowners and a key player in efforts to reverse the decline of bees. It has given Gloucestershire a hive for the Bee Part Of It campaign, based at Hidcote Manor Garden near Chipping Campden. For more information about opening times and entry costs at Hidcote Manor Garden, please visit the National Trust website. The project will help raise awareness of the threats facing local bees and offer opportunities to get involved. "Bee consciousness is vital and we want more people to understand the crucial role bees play in our food chain," said Matthew Oates, The National Trust's advisor on nature conservation. "We can do simple things like planting bee-friendly plants and flowers to encourage bees into our gardens," he added. It's been widely reported that all native bees in the UK have been in decline for some time. A combination of factors are believed to be responsible including a loss of wildflower habitats and the diversity of plants within them, the use of pesticides and disease - but recent poor summers have also caused enormous damage to honeybees, with a third of colonies lost in 2008. Professor Francis Ratnieks of Sussex University is Britain's only professor of apiculture, the study of beekeeping. He said it's impossible to predict how the 45 new Bee Part Of It hives at National Trust properties across the UK will fare. "You're not guaranteed anything. For a start, the queen could die, and if the colony fails to rear a replacement queen, the colony will die out. "A colony can also swarm, meaning that half the worker bees and the queen leave to set up a new colony. This is nature and nothing is guaranteed." 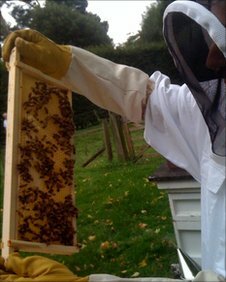 Owning a hive and learning to be a beekeeper has become a popular pastime, with many people taking courses run by the British Beekeepers' Association (BBKA). "Our membership has increased by around 4,000 people in the last 12 months," said Martin Smith, president of the BBKA. "A typical course might include a couple of days' theory and 10 practical sessions spread over the season. 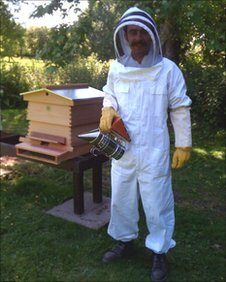 "In terms of cost you're looking at around £500 to get yourself started as a beekeeper. It's important too that if you're starting a colony to try and source the bees from your local area," he added. If becoming a beekeeper is a commitment too far, then planting bee-friendly flowers or creating a home for solitary bees is a less time consuming option. "I'd encourage anybody who has the appropriate space to do a course through their local beekeeping association and start keeping bees themselves, but for some people that's just not practical," said Springwatch presenter Kate Humble. "However it's very easy for all of us to do our bit for honeybees, bumblebees and other pollinating insects by planting the sort of plants and flowers they love - either in our gardens or in pots on windowsills or balconies. "To have bees visit you is like having nature's own expert team of gardeners working really hard for you as they help pollinate your vegetable patch, fruit trees, flowers - anything that depends on pollination," she added. During Bee Part Of It!, BBC Radio Gloucestershire will focus on our hive at Hidcote and the honeybee, but it's important to appreciate that other bee species play a vital role in the pollination process. Solitary bees have been found to be 300 times better at pollinating apple blossom than honeybees and there are vegetables, like tomatoes, that are only pollinated by the bumblebee. A range of other insects also play their small, but vital part, in pollinating our fruits and flowers. According to the charity Buglife, 90% of wildflowers could be threatened with extinction without insects to pollinate them. Honey, chocolate, coffee and silk are just some of the luxuries that wouldn't exist without invertebrates. 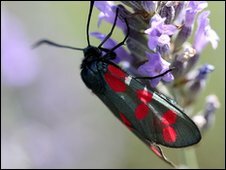 "Humans and wildlife depend for their survival on the pollination services that are provided by hoverflies, butterflies, moths and beetles as well as all the bees," said Matt Shardlow, ecologist and chief executive of Buglife, the Invertebrate Conservation Trust. "The loss of wildflowers in the countryside has pushed many species to the brink so it's really important to plant wild type flowers and put them back into the countryside," he added. You can keep across the life of Gloucestershire's Bee Part Of It hive with Chris Baxter, mid-morning (9am-12pm) presenter on BBC Radio Gloucestershire. 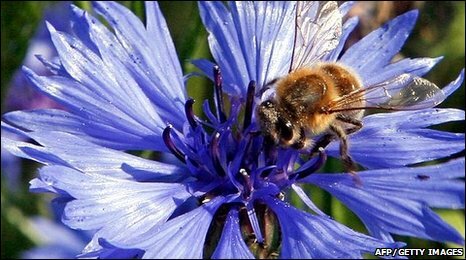 To be part of it where you live, BBC Radio Gloucestershire has 1000 packets of free bee-friendly wildflower seeds to distribute as part of the campaign. Please call in to our reception on London Road, Gloucester, to get a packet for yourself. We'll also be giving away packets of wild-flower seed at events we're attending over the summer. Beekeeping isn't just a rural operation - bees can thrive in villages, towns and cities as long as the conditions are right. In August 2010 BBC Radio Gloucestershire's Chris Baxter went to visit the hive at Hidcote Manor to see just how busy the bees have been, and already they've produced some honey. Trainee Gardener at Hidcote Manor Garden, John Bainbridge, who is the BBC Radio Gloucestershire beekeeper, said they should soon be able to collect it. "We're just waiting to get an extractor from Shipston Beekeepers, so the honey should be in jars in a matter of weeks," he said. "I've been stung a couple of times. One time I took the lid off just to start the inspection and I was immediately stung behind the ear." Listen to the Chris Baxter show on BBC Radio Gloucestershire on Monday 13 September 2010 to hear more about our Hidcote Manor hive. 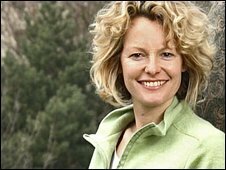 Bee Part Of It: Have Kate Humble's bees survived?